New York City is hot, people. At Gotham's amazing Brooklyn warehouse with the blue plastic tiles of insanity, someone joked that we were going to do Bikram land drills. We definitely sweated as much as in the hot room and Zandy's comment on Gotham's off-skate training: "Basically, they do the same things we do. Except we don't do them for 2 1/2 minutes." At this point, it was about 1:30 a.m. according to our inner clocks but luckily the sweat took care of the lingering airplane-cabin smell on us and gearing up gave us a second wind. The latter was devoured by a fantastic practice focused on solid defense with short and effective bursts of offense. During the last half hour of scrimmaging, we swear the blue plastic tiles suddenly transformed from being super-sticky to ice-like slippery... At least, we did get a good up-close look at that floor. A lot. And with the great coaches and skaters and all the things we learned even that was fun! 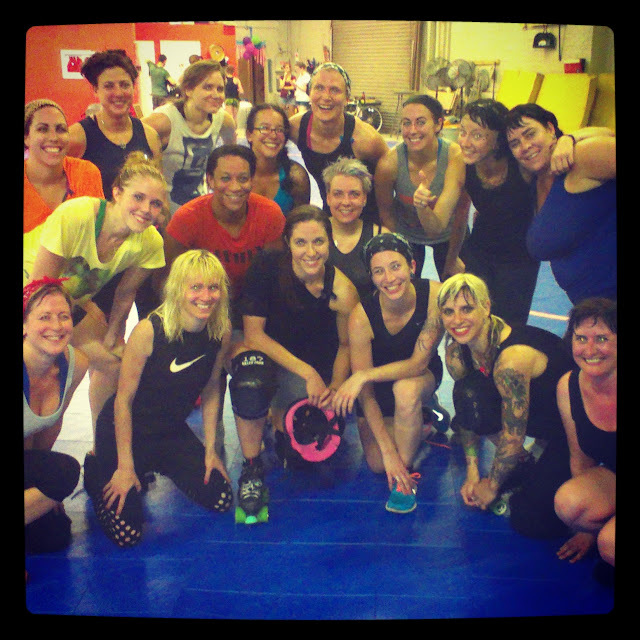 Thank you so much, Gotham Girls Roller Derby for letting this be our first night in the States! Da ist ja auch die Blitzi!